Seven has won its fifth straight week of ratings for 2016. There has been very little change from the previous week, with Seven still well ahead of Nine thanks to My Kitchen Rules. The most interesting battle playing out right now is at Breakfast where Today (335,000) has its fifth straight week over Sunrise (300,000). On the flipside, Nine is going great guns at Breakfast but not where it counts most: primetime. The race is also tighter for third place as ABC remains ahead of TEN. Without I’m a Celebrity Get Me Out of Here it will be interesting to see how TEN fares between now and the return of MasterChef Australia. Seven: My Kitchen Rules (Tues: 1.51m), Sunday Night (1.19m), Seven News (989,000) and Wanted (872,000). Nine: Nine News (Sun: 1.04m), A Current Affair (817,000), The Big Bang Theory (Tues: 753,000) and 60 Minutes (728,000). ABC: Doc Martin (1.06m), Death in Paradise (891,000), ABC News (Sat: 865,000) and The Doctor Blake Mysteries (858,000). TEN: I’m a Celebrity Get Get Me Out of Here (Wed: 795,000), American Crime Story (590,000), NCIS (569,000) and Modern Family (563,000). SBS: Insight and 24 Hours in Emergency (both 294,000), Food Safari Fire (258,000) and Vikings (246,000). Seven took out Sunday, Monday, Tuesday, Wednesday and Friday. Nine scored on Thursday and Saturday. Seven won all five cities. Easter non-ratings begin on Sunday. When you wake in the morning switch over to the ABC for lattest up to date news with even a tinge of humour, move away from peroxide alto-ego commercial channels and choose the ABC. I love the Today Show. its way better then Sunrise. Hey David what bout the ratings between Today Extra and The Morning Show. I ran some numbers last week as I always do, and again later this week. Breakfast TV for me I gave up on Today and Sunrise a few years ago, ABC News 24 has it all. Totally agree..both commercial breakfast programmes are so vacuous. 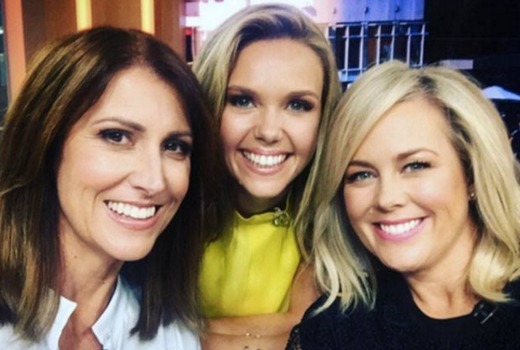 Sunrise needs to flick Sam Armitage she is so light weigh…giggles or makes inane comments. Samantha needs to go along with the rest of the cast. time for the show to move on and grow. the same same rinse and repeat attitude is clearly failing them. Where’s 7Flix? Oh there it is, just above the food network. Perhaps 28 eps of “Benson” a week isn’t what the viewing public want. I’m not sure that 7 movies a week from the 1940’s is that popular either. When MKR ends, 7 will need every bit of help it can get. Where is 7Flix we still don’t have it in Tasmania? Totally agree. They are so in your face. Enough for me to switch channels. Seven need to fix their ugly looking banners on Sunrise which cover up so much of the screen and look hideous. That’s enough for me to switch off every day. I’m watching television for the pictures. I can get info on a screen from the internet.